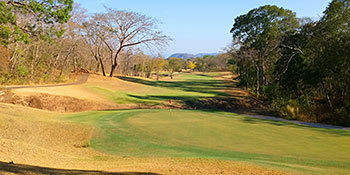 The course at Reserva Conchal Golf Club in Costa Rica’s Gold Coast is a Robert Trent Jones Jnr layout that first opened for play after four years of construction in 1996. Such are the strict preservation requirements in the country, the RTJ2 team managed to set out the eighteen fairways without felling a single native Banyan tree. Several small lakes and lagoons were also built to filter run off from the course and allow water to be recycled. Extending to almost 7,000 yards from the back markers, the course consists of two nines that each meander off into dense rainforest vegetation before returning to sparkling lagoons that run alongside the Pacific Ocean coastline. The round ends with a tough trio of finishing holes which features a wonderful par three sandwiched between two stout par fives. The 212-yard downhill 17th demands an all-or-nothing carry to a water-fronted, three-tiered green at a critical point in the round when flagging golfers will be severely punished. The second best golf course in Costa Rica, this Robert Trent Jones course is of championship quality, at over 7,000 yards from the tips. Although situated right next to Playa Conchal, there are only two holes where you can see/hear the ocean. The fairways can get very dry and burnt during windy season (Nov-Mar) but the Bermuda greens are pretty resilient and roll true. The pro shop is a little small, and is located over by the Reserva Conchal beach club (not in the Westin Resort). I enjoy this course every time we visit. I recommend playing during the rainy season in the always sunny mornings, when the course is in much better shape and lush from the afternoon rains. Played Reserva Conchal Golf Club the last week of March on a five day unlimited golf/practice package. Played here last year and enjoyed it so much had to go back again. Last year had nothing but praise for everything about Reserva including the perfect weather, golf course, wildlife, staff, and natural surroundings. This year the Guancaste Region (and most of Pacific Central America) have experienced extreme severe drought. This phenomenon greatly affected the plants and gardens in the area and the local aquifers are close to being depleted if water is not conserved properly. Two big course differences this year were the ponds on number 5 and 18 were nearly depleted with a significant reduction in the birds utilizing the ponds. The iguanas were still everywhere while the monkeys were less abundant. Played the blue tees at about 6,500 yards which was very enjoyable and manageable. Had the opportunity to hit a lot of rescue clubs and 3 woods off the tee for accuracy. Offline shots that missed the fairway or green took some wicked bounces because of the dry conditions. The course was in excellent condition and the staff did an excellent job keeping the tees, fairways, and greens healthy. The greens held well struck shots, putted true, and were in good condition. I thought the tees and fairways were also in good condition. My favorite and most difficult holes on the front nine were the 423 yard par 4 2nd, the 452 yard par 4 3rd, and the 413 yard par 4 6th. My favorite holes on the back nine included the 423 yard par 4 10th, the 411 yard par 4 12th, and the 186 yard par 3 17th. The 17th still had water in the pond in front of the green. The 515 yard par 5 18th was the easiest for me all week as it played downwind and was easily reachable in 2. The pond on the entire length of the hole on the left and in front of the green was not a big threat this year as it had virtually no water. Overall another great golfing experience visiting Reserva Conchal and would definitely visit again and highly recommend it to anyone visiting Costa Rica. The staff were all first class and the weather was again absolutely perfect from sunrise to sunset. Staff at the club said they are hoping to get some rain in May. They do need it. Played Reserva Conchal Golf Club using a 5 day unlimited golf card the last week of March. The weather was absolutely perfect from sunrise to sunset every day. 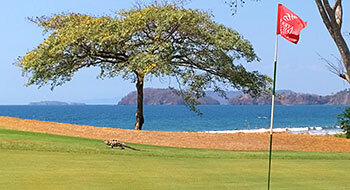 Throw in the Pacific Ocean, the native Costa Rican dry tropical forest, and the golf facilities and it makes for a wonderful combination. The forest includes coatimundi, monkeys, iguanas, raccoons, countless exotic birds, and native species of trees that made this a truly memorable experience. Robert Trent Jones ll designed the course and as he has stated “The very best courses are those where nature has provided the canvas and my job is to discover her secrets and reveal them. I try to design golf courses that will fascinate people so they’ll want to play them many times and learn the depths and meanings of the courses’ stories, their subtext, their poetry.” Thanks RTJ ll, you made me want to play this course many times and enjoy every minute of it. the forest and wildlife around you." Playing this course made me appreciate that nature and golf can coexist in a shared environment. I like to take a lot of pictures but this is the only place I can remember taking many more pictures and videos of the wildlife and trees than the golf course itself. Reserva Conchal is the first course in Costa Rica to be certified by Audubon International. During my afternoon rounds I basically had the course to myself along with nature. One day I was taking pictures of some resting monkeys near the 16th tee and a howler monkey howled and pretty much let me know I was being watched. The monkeys are considered the loudest land animal and can be heard clearly for 3 miles. Quite a feeling being with nature in the Costa Rican tropical forest. Every hole was a fun memorable experience especially when you combine the golf with the surroundings. As far as the golf course alone, Reserva Conchal is a true challenging championship layout that measured about 7,000 yards from the gold tees. The course certainly had several elevation changes and the swirling Pacific Ocean breezes made for interesting club selections. The practice facilities were excellent as there were 4 practice greens, a nice natural grass driving range, and also an area that had a tent to hit under to get out of the sun. The pro shop staff was excellent and their hospitality was exceptional. The course played very hard and firm and the greens were a good speed and rolled true. The greens held shots pretty well as I noticed the greens were hand watered during both the morning and afternoon rounds. The first hole started out with a 319 yard par 4, the shortest on the course, where it was best to be about 100 yards from the green after the tee shot as the green was very shallow and surrounded on 2 sides by a ravine. The second and third were par 4s that measured 438 and 466 yards and were both excellent tests. The 4th is a 585 yard par 5 that is a true 3 shot hole with nice views of the Pacific Ocean. The downhill 209 yard par 3 fifth is protected by a pond on the right and if you go left the ball could bounce to the right on the green. The sixth was a nice uphill 443 yard par 4 that played much longer up the hill on the second shot. The 542 yard par 5 seventh hole could be reached in 2 but is protected by a large pond in front of the green to catch short shots. There is plenty of room to the right to lay up if do not want to go for the green in 2 but there are also 13 bunkers to avoid. The 8th is a 183 yard par 3 that is protected in the front and left by a large ravine and 2 bunkers to the right. The 9th is a solid 422 yard par 4 with a pond along the right side on the drive and in front of the green. The back nine starts out with an excellent 446 yard dogleg left par 4 with a ravine protecting the green to the left and short. The 189 yard par 3 11th has a two-tiered green with an elevated green and is protected by bunkers short and right of the green. The 420 yard par 4 12th is the signature hole on the course and a drive to the left is ideal. The green is elevated and the second shot plays longer than the distance. The 445 yard par 4 13th is another challenging hole with the ideal drive down the left side and another uphill second shot that plays longer than the distance. The downhill 382 yard par 4 14th is the second shortest par 4 on the course but there are several well placed bunkers on the tee shot and around the green. The 154 yard par 3 15th is the shortest par 3 on the course but the 3 tiered green is protected on the right by a large bunker. Shots hit to the left can bounce right on the green. The 554 yard par 5 16th has an elevated tee with views of the Pacific Ocean in the distance. Avoid the bunkers on the second shot and this is a true birdie hole. The 212 yard par 3 17th was one of my favorites on the course as short is not an option as it is all carry over water and 3 bunkers surround the green. The 547 yard par 5 18 hole was a nice way to finish the round as water surrounds the entire left side of the hole and short of the green. This green can be reached in 2 but requires two precise shots. There is plenty of room on the right for those not wanting to take the risk of going for the green in two.